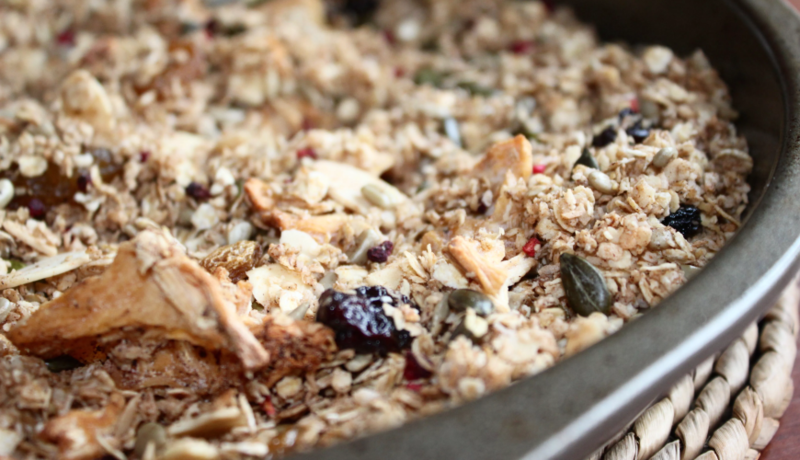 This granola is packed full of delicious fruity goodness & fibre. I enjoy mine with creamy coconut yogurt & fresh blueberries. Pre-heat the oven at 140 degrees. Measure out all the dried ingredients & place in a bowl. Melt the coconut oil & maple syrup on a gentle heat until you have a sticky consistency. Pour over the dried ingredients & thoroughly incorporate. Place granola mix on to an oven tray & heat for 20 minutes until light & brown. Allow to cool before serving with fresh coconut yogurt & blueberries, or any seasonal fruit of your choice. I also enjoy using coconut or almond milk too. Oats are loaded with dietary fibre & have amazing cholesterol lowering properties. They also benefit from manganese, selenium, magnesium, phosphorus, & zinc. Oats are also rich in carotenoids & flavonoids & vitamin E.
The seeds used it this recipe are a great source of protein, fibre, calcium, magnesium, zinc & manganese. Seeds can increase the nutritional profile of most dishes if sprinkled over the top or could be eaten on their own as a healthy snack. Cinnamon has powerful medicinal properties, & is loaded with antioxidants that protect the body from oxidative damage caused by free radicals. Cinnamon can improve sensitivity to the hormone insulin by decreasing the amount of glucose that enters the blood stream after food. Maple syrup is an unrefined natural sweetener choice that contains beneficial nutrients, antioxidants & phytochemicals compared to standard white table sugar. However this should only be used in moderate amounts for natural sweetness. Maple syrup has a lower glycaemic index score to sugar & is derived from the sap of maple trees. Coconut flakes are packed full of fibre, and the oil provides antimicrobial advantages too. This granola is great to batch cook at the weekends, & I often snack on it throughout the day as well as enjoying for my breakfast.